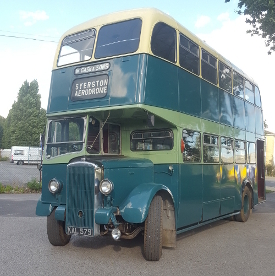 This bus was new in 1948 with a Strachan low-bridge body, one of a batch of four Daimlers which were the first new double deckers bought by independent W Gash and Sons Ltd. The Company was established in 1919 as a corn millers at Elston near Newark. A lorry used for deliveries was later fitted with seats to carry passengers on market days, and in 1926 the first proper bus was bought. In 1932, the Nottingham  Newark trunk service was established along the Fosse Way (part of today's A 46). The 1939  45 war brought new and enlarged RAF airfields to the area, and second-hand double deck buses joined the fleet to meet passenger demand. 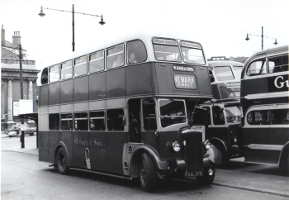 In winter 1948/9, a batch of four Strachan open platform, low-bridge bodied Daimler CVD6s, the Company's first new double deck buses, joined the fleet, which moved in 1953 to a purpose built garage in Newark. Shortly after this, the road under the low railway bridge at Saxondale was modified to allow the operation of full height double deckers, and the Company's next six Daimler double deckers were built with high-bridge bodies. In 1958  60, the original four received new Massey 61 seat high-bridge bodies with platform doors. The Daimlers continued in regular service until the 1970s, on the main Nottingham service and on schools services in Nottinghamshire and Lincolnshire. 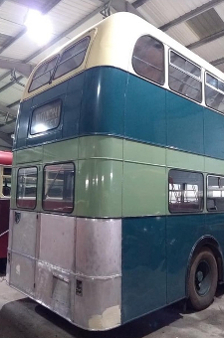 DD 2 was withdrawn in 1979, and entered preservation, passing in 1980 to the collection of the Transport Museum at Wythall, Worcestershire, where it received an overhaul and repaint in 1990-91. Similar DD 1 stayed with Gash long enough to pass to Lincolnshire Road Car when the company was sold to them in 1989, and was retained for special duties for many years, including a few appearances at LVVS events in the 1990s and early 2000s. The Newark  Nottingham service passed to Lincolnshire Road Car, then to Pathfinder and Nottingham City Transport and is now back in independent operation with Marshalls of Sutton on Trent, marketed as the 'Fosseway Flyer', and with buses that keep the connection to the past alive by continuing the Gash fleet number sequence. In 2017, an urgent need to take in some historically important local buses at Wythall meant that some not-so-local buses had to be offered to other museums to create space for the new arrivals. The Trustees at Wythall thought Lincoln would be the ideal place for DD 2 to make a new home. With funding from the Society's catering account, the supply of tea, cakes and sandwiches to hungry visitors at our Transport Festival events has been turned in to the latest member of the fleet, and with the professional help of Wells Recovery at Bracebridge Heath, DD 2 made a return journey along 'The Fosse' coming to Lincoln in July 2017. Quite an amount of work was undertaken when DD 2 was at the Museum in Worcestershire and so it looks rather fine and makes all the 'right' noises! It has however been stored for several years so it does need a little fettling and a service, together with a good clean and polish, and the application of fleetnames etc. Obviously we welcome support or sponsorship from members and friends to get DD 2 on the road again as soon as possible so it can be enjoyed by our many visitors. Batteries are needed together with new tyres, and a rear road spring needs replacing too! January 2018 - The Society's most recent acquisition has now reached the point where it is mobile and has been parked in the Museum, although further work is needed. So far the offside rear spring has been replaced and the brakes serviced, but there is still plenty to do before we can contemplate an MOT test. February 2019 - Rear panelling and a few electrical jobs are receiving attention.